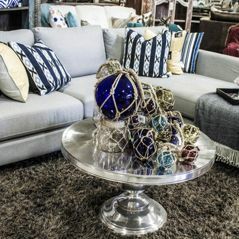 At Showhome furniture we are always arranging and rearranging our tables to help showcase their beauty. 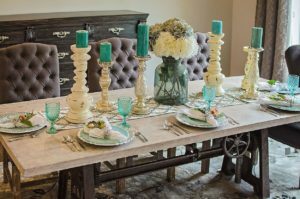 I am always on the outlook for some new unique accessory or furniture to bring into our store. 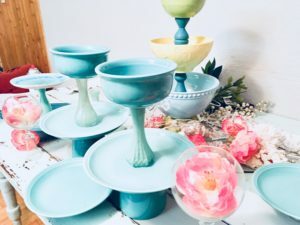 Recently I was visiting my mother and she showed me an easy way of creating my own unique but gorgeous serving dishes.These serving trays are the perfect thing for even a beginner do-it-yourselfer to try. 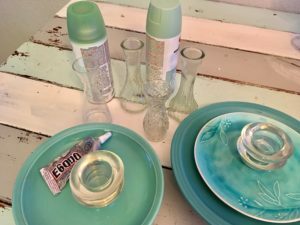 All you need are some dishes, candle sticks, spray paint, and E 600 glass glue. I am using a large dinner plate and a bowl on top. This is perfect for veggies and dip, or a fancy fruit platter. I am also doing one platter that has a large plate on the bottom and a smaller plate on the top. 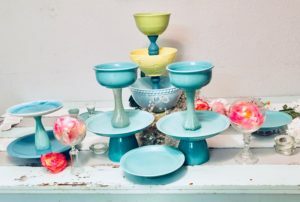 I bought all my dishes and candle sticks at the local thrift store. 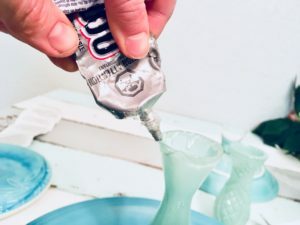 The glue and spray paint I bought at my local craft store. It would have been cheaper if I did not spray paint my candle sticks but have left them clear-which looks pretty as well. 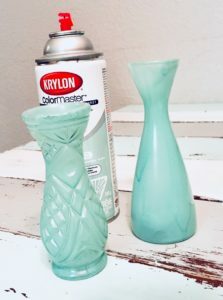 First, spray paint your candle sticks all the same color (or you can skip this step if you want) . Next, turn the largest plate over and glue the base on to the large plate. I used smaller candle holders for one base, a shot glass for another and a used ceramic vase for the last. Make sure your base is centered in the middle of your plate. Leave and let dry for 24 hours. When your plate is dry, flip your plate over and glue one candle stick into the middle of the plate. 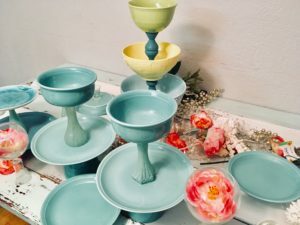 Carefully glue the bowl or smaller plate onto the top of the candlestick. Let dry for 24 hours. 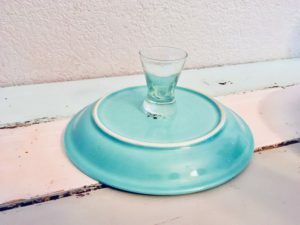 Once your serving platter has dried for 24 hours you can use it like any other serving platter. You can hand wash it, but be careful when you do so. Make sure you used indoor/outdoor spray paint so that the spray paint does not wash off. 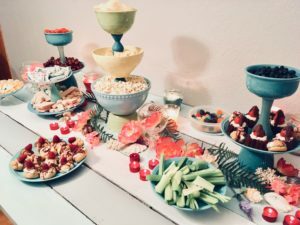 So for under 10.00 and with very little skill, you can create your own gorgeous serving platter that will surely wow your friends.